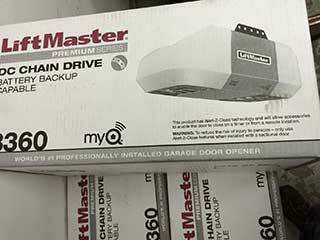 One of the most important factors to consider when choosing your garage door opener is the drive system it uses. The drive is what converts the power created by the motor into the force that pulls or pushes the garage door open and close. Choosing the right one for you is incredibly important, as different type shave different benefits and advantages, and may be a great fit under certain circumstances, and less than optimal for other situations. A chain drive opener makes use of a thick metal chain that drives the shaft. This style of drive is the most commonly used style, as the chain is very strong and reliable. Models that use this type of drive system are often much cheaper than other variations, which is why, so long as you don't have an attached garage, a chain drive opener can be an excellent choice. However, the noise output of this type of opener is incredibly high, so if you have a bedroom or living room next to your garage, this may not be the best choice for you. Another downside is the aspect of maintenance. Chain length must be fitted precisely to ensure it does not run loose, this can lead to varying levels of excess strain on other components. That means that regular chain adjustment will probably be required, which means you'll need to make sure your opener is properly cared for on a regular basis. Openers of this type use a belt instead of a chain. The benefits of this include smoother rotation and greater vibration absorption, which translates to very silent operation. Many will consider belt drive units to be the sleekest and most luxurious option. They are typically made from fiberglass, reinforced rubber or in some cases very strong polyurethane. If you are looking for the most smooth, quiet and impressive option, a belt drive will be hard to beat. Of course, belt drive openers are usually more expensive than their counterparts, so if budget is extremely tight, you may want to consider a different option. Opener models who use this type of drive system are a good choice for those interested in fast operation and low maintenance requirements. These units are made of only a handful of moving parts and although not as silent as belt drive models, they aren't as loud as chain drive units either. They can be somewhat sensitive to temperatures, however, as they are built precisely to work to certain parameters. If you live in an area that sees drastic changes in climate it might be worth considering one of the other types that won't be as easily affected. The majority of garage door openers are installed at the center of the garage. A jack shaft can be mounted to the side of the door, saving a lot of space. Your door must have a torsion spring for a jackshaft opener to be able to work, and there must be a certain level of room beside the door for the device to be fitted. The required sideroom is usually at least seven inches, depending on the exact model you chose. It is always important to consider how often do you think you'll be using your garage on a day to day basis. If you will only be using it once or twice a week, noise is not such an important factor. The weight of your door is another key thing to take into account. It will determine how much horsepower your new opener will need to produce. If you'd like to consult a professional, our team at Garage Door Repair Spring is here for you.